Central cockpit cruiser with full cover. Aft cabin with 2 single berths: one single 170 x 90 cm and the other coffin size 200 x 60 cm. Little but functional heads & shower & sink. Forward starboard is a galley, port side seating (could be used as a single bed 185 x 50 cm ) and forward a cabin with a double bed 190 x 130 cm. 2 folding tables can be used either in the galley or in the cockpit. Electric converters when using shore power. Cockpit cover could be removed totally or partially. 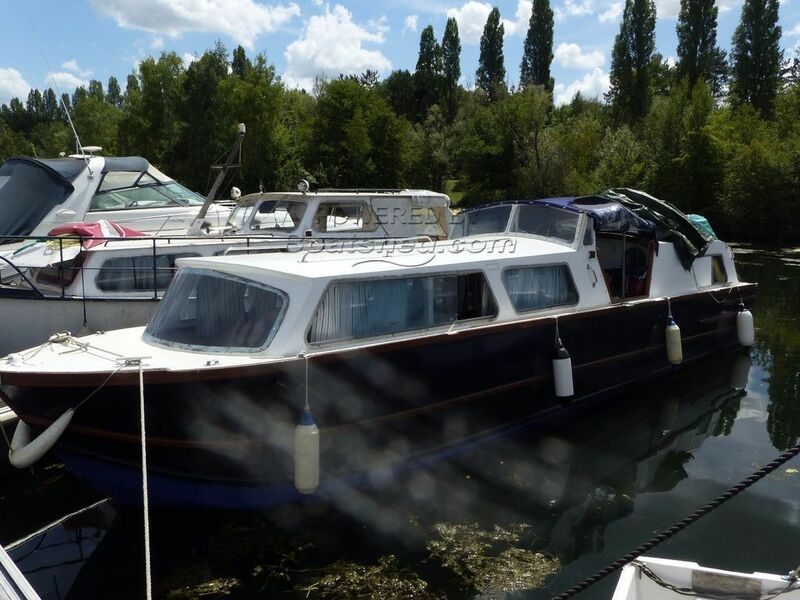 Inland cruiser for sale in France. Boatshed Paris is happy to offer this Dawncraft 27 for sale south of Paris. English canal and river cruiser, has been partially restored, One 25Hp out board engine for propulsion, all the essential are on board this 8.10m boat, few things need to be finished such as upholstery and mostly decoration. Moored in a very nice, calm and private marina south of Paris, away from the noise and surrounded by trees. Secure car park, all commodities and access to central Paris very easily. Water activities near by too.